Introduction: Protagonist Meg Murry, eldest child of a physicist and microbiologist, is a misfit at school. With the help of three amazing beings, Meg; her younger brother, Charles Wallace; and friend Calvin O’Keefe, embark on an intergalactic adventure to find her missing father and ultimately save the world. This classic tale of good versus evil won the Newbery Medal in 1963 and has recently been adapted for the big screen by Walt Disney Studios. Note: It is not necessary for the students to have read the book or seen the movie to participate successfully in the provided lessons and activities. The student will analyze the possible meaning of quotations by a specific author. The student will be introduced to reference materials containing famous quotations. Introduce the lesson by showing the students the cover of A Wrinkle in Time and telling them this book contains some very unique and memorable characters, including the bespectacled Mrs. Who. It seems that she has a difficult time verbalizing thoughts in her own words, so she often quotes famous people such as Goethe, Shakespeare, Dante and Euripides. Tell the students that famous quotes such as these can be found in special reference books. Show them examples of quotation books or point out where these books are located in the library. Inform the students that the author of A Wrinkle in Time, Madeleine L’Engle, is also known for some interesting quotes. Some appeared in her books, and some are things she said at other times. Display the visual. Encourage students to discuss the questions, emphasizing that there are no right or wrong answers, as what the author meant is open to interpretation. Distribute the activity sheets and review the contents with the students. Students may work in pairs or small groups. Encourage students to share their interpretations with the class. As an extra challenge, ask students if they know which quotes came from A Wrinkle in Time. Art: Supply art materials and challenge students to make greeting cards based on the provided quotations. 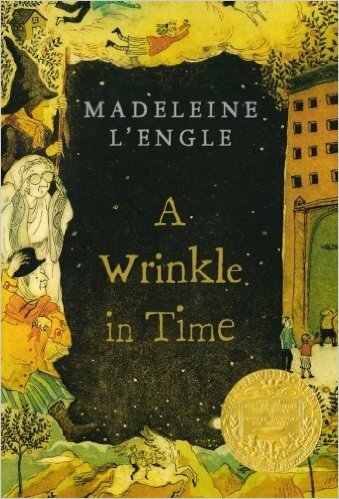 Introduction: A Wrinkle in Time won the prestigious Newbery Medal in 1963. The book has been continually in print since its initial publication. (Ironically, it was rejected by more than 26 different publishers before finally being published.) Today there are many award programs honoring children’s literature. Students may enjoy creating a book award of their own. The student will be introduced to various contemporary book awards. The student will develop a new award describing its criteria and listing past recipients. Introduce the lesson by showing the students the cover of A Wrinkle in Time. Ask them if they know what the seal on the front of the cover represents. Describe some of the major awards for children’s literature. For example: The Newbery Medal is awarded annually to an author selected to have made the most distinguished contribution to American literature for children. The Caldecott Medal is awarded to the artist of the most distinguished picture book for children. The Coretta Scott King Book Awards are given to outstanding African American authors and illustrators of children’s books that demonstrate an appreciation of African American culture and universal human values. The Pura Belpré Award celebrates the Latino cultural experience in an outstanding work of literature for children. Explain to the students that they will now have an opportunity to create their own award for a type of children’s literature of their choice. Display the visual and review its contents with the students. Explain to the students that the “Out of This World Book Award” does not exist. However, if it did, A Wrinkle in Time would meet all the criteria. The concept of traveling through space using a tesseract is a scientific theory. Meg, Charles Wallace and Calvin visited three different planets: Uriel, Camazotz and Ixchel. While the book has appeal for all ages, it is especially appropriate for upper elementary and middle school students. Brainstorm ideas for potential award categories. Possibilities include: Unplanned Adventures, Super Science Fiction, Twins in Literature, From Misfits to Heroes, Love Always Wins, Special Siblings, Science in Fiction, Strong Female Characters and Wonderful Witches. Distribute the activity sheets and writing tools. Instruct students to fill out the necessary information. Students may work in pairs or small groups. Suggest that the students use the school library’s catalog system to search for the book titles for the “Former Recipients” section of the activity sheet. Encourage students to share their ideas for the special book awards with the class. If time allows, have the students vote for the award idea they think was the most original. Introduction: Margaret “Meg” Murry is unhappy, hot tempered and very smart. She misses her father, worries about her mother and loves her little brother very much. Through a series of astonishing events, she becomes an unlikely hero. In this activity, students will discover that Meg is not alone in the world of fantastic female literary characters. The student will demonstrate knowledge of literary characters. The student will participate in a creative problem-solving group activity. Prepare and collect materials prior to class. Copy multiple sets of the Character Cards (one set per each pair or small group of students). The sets are easier to maintain if copied on different colors of cardstock. Introduce the lesson by telling the students that today’s activity will feature children’s books that feature female main characters. Distribute the Character Cards to pairs or small groups. Read the names on the cards to the students. Instruct the students to group the cards into two sets: the characters that they can name the book or series in which the character is featured and the characters that they cannot match to a book or series. Ask the groups to report on the number of characters they were able to identify. The group with the most gets bragging rights. Note: All of the featured characters have appeared in popular movies and should be recognizable to most of the students. Explain that the Character Cards will now be used for a fun ranking activity. Tell the students that there is no right or wrong order in which the cards are to be ranked as long as they can justify their choices. Select ranking topics as time allows. After giving the students a ranking topic, allow them 2–3 minutes to rank their Character Cards, then encourage them to share their ranking results with the rest of the class. Encourage discussion. Continue with the activity as long as time permits. Compare and Contrast: Instruct the students to select two of the characters and write at least five ways these characters are alike and five ways they are different. This information can be placed into a Venn diagram. Research: Encourage the students to select one of the featured authors to research. They are to write a short report on his/her life and other works this author has written. Who Dreams of: (hyperbole) Finding her father and saving her brother! Lynne has been an educator for more than 40 years, serving as an elementary classroom teacher, a gifted educational specialist and a middle school librarian. She is currently a teacher consultant at James Madison University in Harrisonburg, VA. She is the author of the “Magical Library Lessons series, From Snicket to Shakespeare” from UpstartBooks and the “From the Big Screen to the Classroom: Using Movies to Teach in the Content Areas” series published by Pieces of Learning. Previous 33 Winning Summer Reading Program Ideas	Next #DemcoMakerChat Roundup: What Is Meaningful Making?